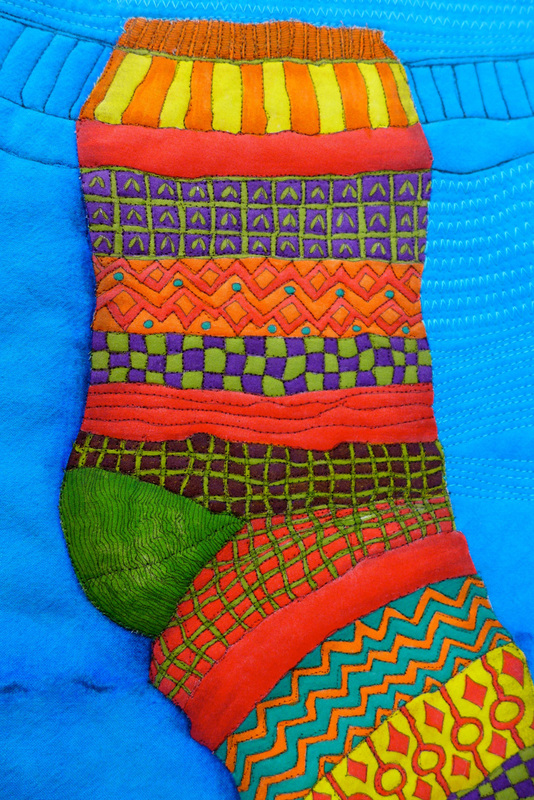 Sockittome – the quilting- Capture and Create. I’ve been working on the Sockittome quilt. But not as much as I would like to. I don’t know, I spent an entire day on the internet yesterday and I worked on packing and classes today. I want to finish quilting the shoes and the last piece of the Bayeux. However, the business side has to be finished before I put the hands on the quilt. To be really honest, I had no idea how I was going to quilt the piece. By that I mean the turquoise background. The socks are dimensional with shading by pencil following the shadow underneath the sock. 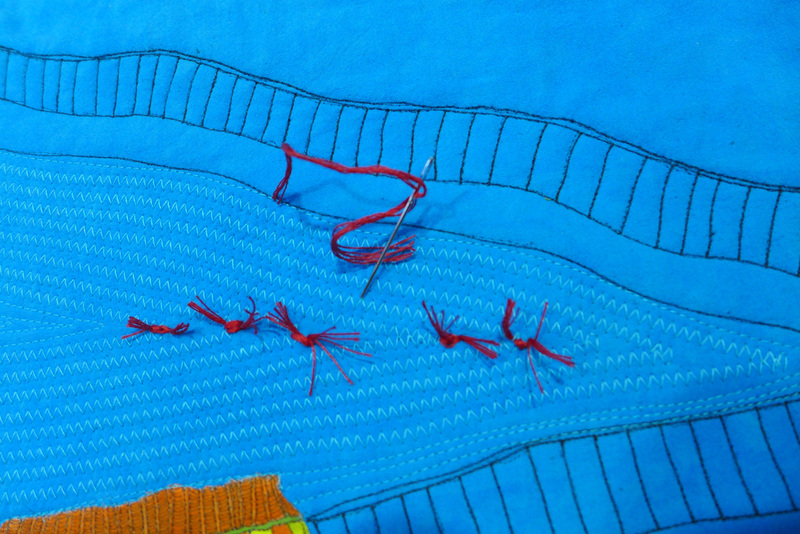 Handling the piece has rubbed some of the pencil off, but I will re-do it when the stitching is finished. I’m still going to add the knitting needles, and the wool balls, I thought I would have 4 small balls of wool winding down from the needles. Now I’m not sure, I’ll have to audition it once I’ve finished the background quilting. I tried the couching foot on the sweet 16 and I wasn’t happy with my attempts, so I might practice a little more, my gut feeling says I will zig zag, couch the thread down for this piece. I wanted to make the ball of wool with couching too, but maybe not. 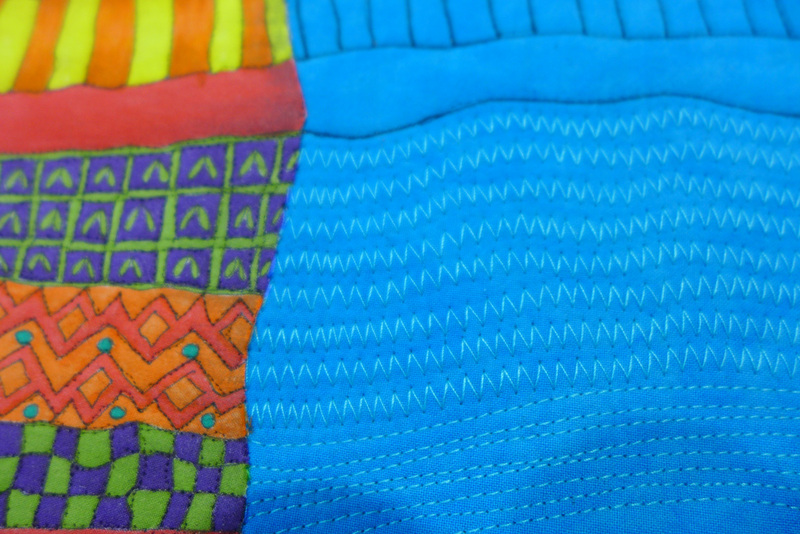 For the quilting I’ve used a lighter shade of turquoise 50 weight cotton thread. I wanted it to look like knitting stitches so I used a zig zag stitch. I use a Janome and it has the wonderful accufeed foot so quilting is a breeze. I will add straight lines, circles and texture in other colors, but I have to be very careful they don’t take away from the stark image of the socks. The sock itself has been quilted on every drawn line with smoke monofilament thread and a 50 weight grey Superior Masterpiece on the back. The weight of teach type of thread balance quite well. I have to be very careful how I turn at the sock, I have a few tricks and I will share them later. I didn’t like the intersection where I turned the zig zag, so I experimented by adding a knot of embroidery thread. Voila, it’s interesting. 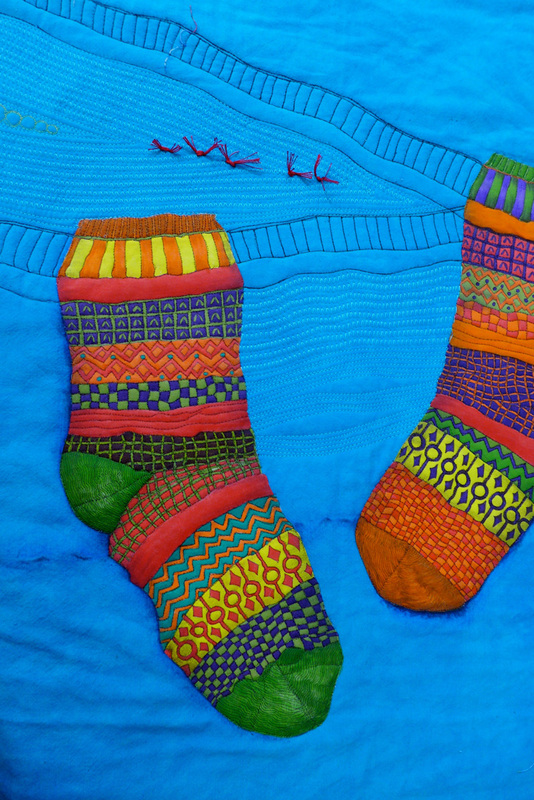 Love how you have incorporated the pattern at the top of the socks into the background quilting using the darker thread. I am improving using my Janome and accufeed to quilt… so pleased with that purchase! This is becoming a very happy quilt. Thanks again for sharing your process in such detail. Previous PostFolk Art Collection – Art to Survive.